Samuel Hoffman | The Journal Gazette Students from Lutheran South Unity School wave their scarves in their dance during the Rally for School Choice on Tuesday. Stan Lipinoga, principal of Most Precious Blood Roman Catholic school in Fort Wayne, isn’t sure how much school enrollment has grown since the state voucher system was instituted in 2011, but he thinks the program is beneficial. The program "has been such a blessing to so many parents and so many families," Lipinoga said. Students who couldn’t afford to go to a school such as Precious Blood are now able to attend by accessing the state-paid voucher program or through scholarships paid for by donors, commonly referred to as SGOs. Other sponsors included Blackhawk Christian School, the Indiana Non-Public Education Association, the Indianapolis-based Friedman Foundation and the Institute for Quality Education. There were speakers at the rally, and students from Lutheran South Unity School performed. 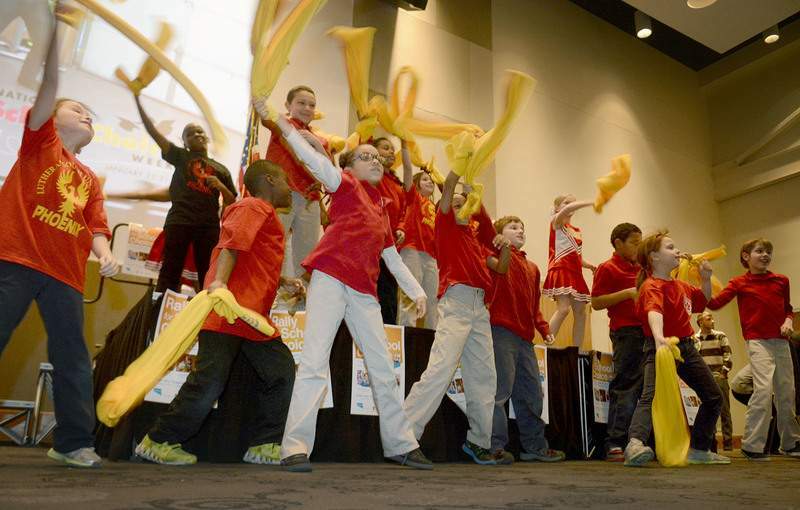 The event was aimed at raising awareness for the school choices Indiana students have and to celebrate the success of the Indiana programs. Mark Muehl, director of the Northeast Indiana Lutheran Schools Partnership, led the crowd in a chant of "School choice, good choice." "We’ve got lots to celebrate," said John Elcesser, INPEA executive director, who spoke at the rally and outlined the surge in private school voucher programs in numbers. The program began in 2011 with 3,919 students and jumped to 9,139 for the 2012-13 school year. Those numbers surged to 19,809 for 2013-14 and totaled 29,142 for 2014-15. About 9,000 additional students are access SGO money, said Tosha Salyers of the Institute for Quality Education. Gov. Mike Pence’s proposal regarding vouchers would lift the ceiling on the amount of money that can be used to fund the tax credit scholarships or SGOs, currently at $7.5 million, and raise the possible K-8 voucher amount depending on the school district. Currently, K-8 vouchers can be no higher than $4,800 per K-8 student. Supporters want that voucher limit to be the same as high school vouchers that max out at 90 percent of the student’s home-district per-pupil funding. For example, in Fort Wayne Community Schools where per-pupil funding is $6,275, the maximum possible amount would be increased to $5,648, according to a chart supplied by the Institute for Quality Education. Terry Breininger, executive director for Concordia Lutheran High School, said the combined voucher and SGO programs allowed the school to grow by about 100 students. Current enrollment is 742 students. "It’s opened the door for more people to come to Concordia," Breininger said. While that’s true, at least one school now has more students needing special services that are provided by the public schools. Queen of Angels Principal Rebecca Elswerky said her school has about 12 students who need the help of a speech pathologist, occupational therapist or have some other kind of special need, a number much higher than before. Salyers urged those attending the event to write their legislators and disregard the "strong rhetoric" against the program that, by Friedman Foundation estimates, could reach 50,000 students if all voucher slots are taken. In Allen County, where 3,449 students are enrolled in the voucher program, there are places available for 2,000 more, Friedman estimates. While FWCS board President Mark GiaQuinta finds the program contrary to the American principle for separation of church and state, the board’s vice president, Julia Hollingsworth, finds the term "choice" arbitrary. "Private schools choose you, not the other way around. They choose to accept you or they choose not to accept you, and they also choose whether or not they keep you. If you don’t perform, they won’t keep you," Hollingsworth said.